A crown — a life-like “cap” made of dental porcelain that permanently covers an existing tooth — is an effective way to restore a still-viable decayed or broken tooth’s appearance. Properly fitting the crown over the tooth requires some healthy tooth structure above the gum line. But what if the tooth has broken down to the gum line? In this case, we would need to perform a common procedure known as crown lengthening to expose more of the tooth. Crown lengthening is a minor surgical procedure performed with local anesthesia to numb the tooth, surrounding gum tissues and supporting bone. We first make tiny incisions inside the gum-line on both the cheek and tongue side of the tooth to expose the bone, and then carefully remove a small amount of bone from either side of the tooth; this will expose or “lengthen” the tooth. Once finished, we suture the gum tissue back into place with self-dissolving sutures against the bone and tooth. Most procedures take only sixty to ninety minutes, and the mild discomfort afterward is usually managed with pain relievers like ibuprofen. While the gum tissues may appear to be healed after a week, we typically wait six to eight weeks to perform the final crown restoration to give the tissues time to fully mature. 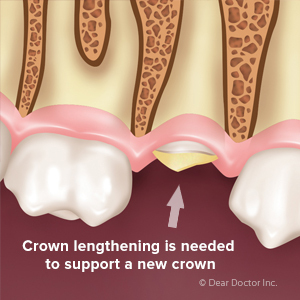 Crown lengthening may not work in all situations, especially with a severely fractured tooth. In these cases, we may need to evaluate the long-term viability of the tooth and consider other restorative options. Depending on your bite, it may also be necessary to treat with orthodontics first: not only will the tooth move into a better position, but the treatment may move both the gum and bone down with the tooth. Subsequent crown lengthening will then only affect the intended tooth and not adjacent ones, resulting in a more even smile. The first step is for us to decide after a thorough examination if you would benefit from crown lengthening. If so, this minor surgical procedure could pave the way for better mouth function and a more attractive smile.